ChickChat: some advice i really need to listen to myself. Seems like you can't check Facebook or read a paper these days without hearing about the latest 'outraged offense' or insipid apology for some offense someone may have caused. Most of the time, offense is TAKEN, not forced on us. Seriously. I'm guilty of this. It may not be a conscious or deliberate choice to feel offended, but I do make a choice to allow it to affect me, I do make a choice to respond, I do make a choice every time I play that remark or image over in my head. The Outraged Offense Game is being played everywhere -- by politicians, by the media, by social media -- and we're buying into it, by being offended and then demanding the object of our disgust or anger should apologise. Then we feed each other on our outrage, and the next thing you know, there's a full-scale brawl and people are getting more and more offended, and feeling hurt, and attacking one another, and most of the time it's ABOUT CRAP. If you feel offended, OWN IT. 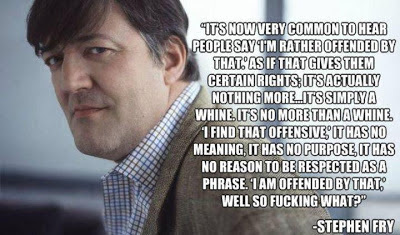 Say, I TAKE OFFENCE -- not YOU HAVE OFFENDED ME. Stop being a victim. Take back some power over your own emotions. And let it go, unless it's truly worth fighting over. I feel like everyone is getting a tad precious lately. Surely, not everything is an 'ism' of some sort or politically incorrect. Yeah, I don't know why it's been happening, and I know I've been guilty of buying into it, but enough. Taking offense is the new way of passing the responsibility. Love that you wrote this. Thankyou! I LOVE your comment! 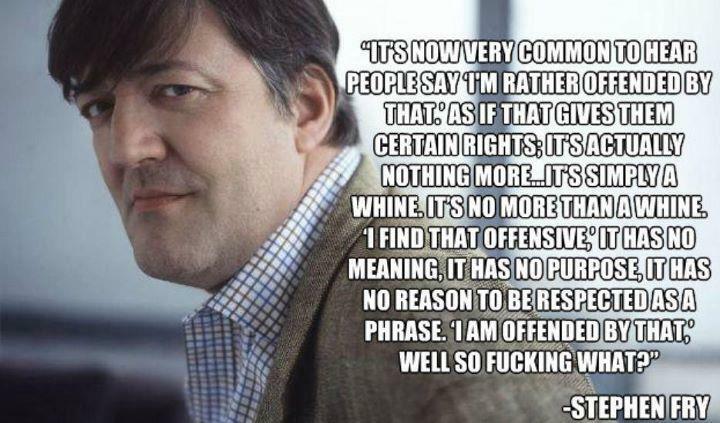 I agree with the Stephen Fry quote. I've been known to say things like "get over it". Maybe I've offended a few people by saying that, but really, get over it. Move on. Life is too short.